John Hutton has been named as the new work and pensions secretary following David Blunkett's decision to resign. Mr Hutton, in the Cabinet as chancellor of the Duchy of Lancaster since the election, has been Mr Blunkett's biggest defender in recent days. He said he would take forward a "radical reform agenda" on welfare, including changes to incapacity benefit. The 50-year-old also has to deal with the UK's pensions funding crisis. His successor as chancellor of the Duchy of Lancaster will not be announced this week, the prime minister's official spokesman has said. As he took up the job, Mr Hutton paid tribute to his predecessor "as a tremendous servant of the British people". He said: "The prime minister has made clear my job is to press ahead with the government's radical welfare reform agenda so that rights are properly matched with responsibilities; I am very much looking forward to that challenge. "We will reform incapacity benefit so it continues to support those who genuinely cannot work, but can better help and support those who are able to return to work. "And we will address the challenge of creating a pension system that allows people to enjoy secure retirement in a country where there will soon be more people over the age of 80 than under the age of five." Mr Hutton was educated at Magdalen College, Oxford, and was a senior law lecturer at Northumbria University. 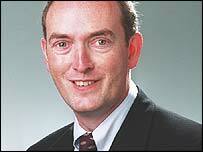 He was first elected as MP in Barrow-in-Furness in 1992. He was a health minister between 1999 and the general election in May. In appointing him as work and pensions Secretary, Tony Blair has replaced one key loyalist with another. Mr Hutton is among a select band of Blairites who have proved crucial allies for the prime minister. Appointed a health minister back in 1998, friends feared he had become stuck after being promoted to the department's number two. Those fears were proved unfounded when he succeeded former boss and fellow Blairite Alan Milburn as Chancellor of the Duchy of Lancaster. While Mr Milburn used the post to plot Labour's election campaign, Mr Hutton was charged with chasing up reform and delivery across government. Now he finds himself facing the daunting task of pushing through changes to incapacity benefit. The reforms are designed to help up to one million of the 2.7 million claimants back to work. But they face stiff opposition from Labour backbenchers who are concerned vulnerable people may be forced off benefits even though they are unfit for work. The controversial issue is said to have caused tension between Mr Blunkett and Mr Blair, who is reported to feel that the proposed reforms do not go far enough. One of Mr Hutton's first jobs will be to deal with the final report of Adair Turner's Pensions Commission, due at the end of the month. It is expected to underline warnings of a massive black hole at the heart of Britain's pensions. Mr Turner is likely to say Britons must save more or work longer to avoid poverty in old age. This will mean Mr Hutton having to decide whether to push forward controversial legislation which will delay the official retirement age. He will also have to consider whether to introduce compulsory saving for pensions.